So, the whole town looks more or less like this place. I loved it there! Posted on December 15, 2016, in Photography and tagged 365 photo project, abandoned buildings, architecture, black and white photography, downtown, Leica, melinda green harvey, monochrome, one day one image, photo a day, photography, postaday, Ranger Texas, texas. Bookmark the permalink. 9 Comments. Good – because that’s what I was going for! Lovely pic, Melinda. Is it sepia or an unusual colour pic? I can’t work it out. I shot it with my B&W camera, then applied a color tone to it in post. It looks very nice. I like the post processing. Thanks, Pablo. Most of the buildings in the this town didn’t have a roof, but this one did – it was in fine shape, relatively speaking! But I think anyone going inside would probably be smart to wear a helmet! 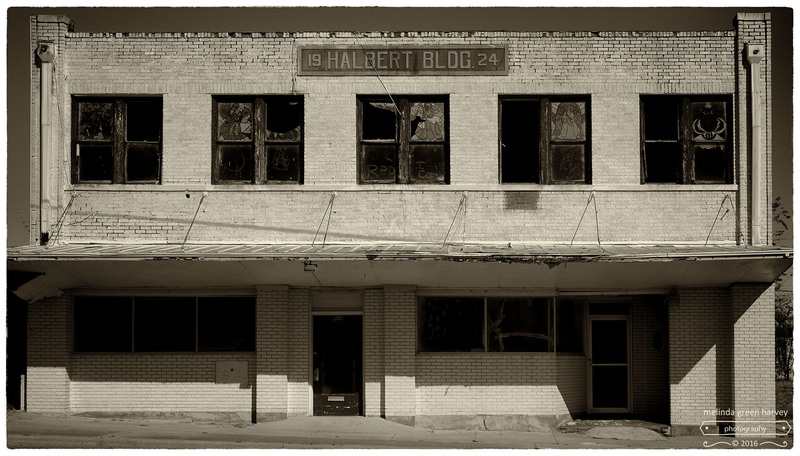 Who or what is Halbert Blog? I’m assuming 1924 is the year this building was erected. Makes a good image, whatever, Melinda. Now, don’t quote me on this, but I think Halbert Blog was the gentlemen who actually developed the idea of a “blog.” Of course, in 1924, it looked different from current “blogs” but the Reader view was actually better than the current WP one. The other, less likely scenario, is that there was some family name Halbert with enough $$$ to build their own building in 1924.